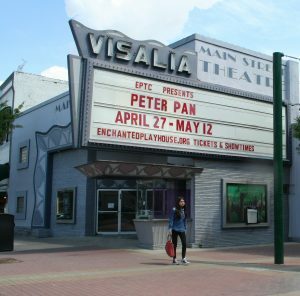 Visalia City Hall wants the Main Street Theater returned to private ownership, and a pair of bidders are vying for possession of the one-time movie house at Main and Garden streets. The sale could mean a local theater group will find itself homeless. In an effort to preserve the character of the city’s downtown, the group that takes the prize–either Rainmaker Productions or Legacy Investments–won’t win it based on the highest bid alone. Also playing into the decision is how the winning bidder plans to use the theater, which has served as home to the Enchanted Playhouse Theater Company since 1992. The theater’s price-tag, with minimum bids starting at $450,000, were too rich for the dedicated group of amateur actors. While it could fall out the new owner allows the Enchanted Playhouse to continue using the space for its productions, the group likely will have to find new rehearsal and set-building space, and storage for its trove of costumes and props. But, Hardin says the shows will go on, she just doesn’t know where. Yet. Which party placed the winning bid by the April 20 deadline will make a lot of difference on where future Enchanted Playhouse productions will be staged. The sale will not effect the Playhouse’s current production, “Peter Pan.” Remaining dates for that show are May 4, 5, 6, 11 and 12. Call 739-4600 for times and tickets, or visit enchantedplayhouse.org. It seems likely Hardin is pulling for Rainmaker Productions to win the bidding war, as the group plans to rent the 400-plus-seat hall to other users should it take possession. Since the mid-1990s, Rainmaker Productions has been bringing acts with nationwide and global recognition to Visalia. Past performers have included Tony Bennett, BB King, the Moody Blues and Visalia’s own native sons the Doobie Brothers. Upcoming acts include Jethro Tull’s 50th Anniversary Tour on June 5, comedian Brian Regan on June 10 and vocalist LeAnn Rimes on June 22. All three shows will be at the Fox Theater. Tickets and information are available at rainmakerpro.net. The other would-be theater owner is Legacy Investments, a privately-held investment group associated with CRS Farming of Visalia. It is not known if Legacy intends to continue operating the theater or if it intends to repurpose the building. C.R. Shannon is listed as Legacy Group’s executive member, according to Buzzfile.com. Additionally, CRS Farming employs around 15 people and generates approximately $1.4 million in annual revenue, the website said. Founded in 1970, CRS “primarily operates in the non-residential building operations business/industry within the real estate sector,” Buzzfile.com reports. If keeping the Enchanted Playhouse playing downtown is City Hall’s goal, then it would seem Rainmaker Productions, with its music and theater experience, is the obvious choice. However, what criteria will be used to evaluate the two bids is something the city has kept close to its vest. It’s also not sure when the final decision will be announced. The best “guestimate” from the city’s Purchasing Department is about a month from the April 20 deadline for proposals. That means the fate of the Enchanted Playhouse Theater Company should be known by the middle of May, just as Peter Pan is returning to Neverland. Meanwhile, the city is also selling the former car dealership parking lot located across the street from the Main Street Theater. The group interested in buying the property intends to construct a two-story multi-use building including residential space on the upper floor.